Welcome to Day 25 of 31 Days to Better Recordings. Sounds really smart and artsy, right? But what does it MEAN?! That’s a fair question. When you’re mixing a song, whether you’re dealing with a few tracks or several dozen, you are assigned with the task of somehow combining all of those tracks into a pretty, cohesive, smooth-sounding mix. Consider baking a cake. Just because you throw flour, eggs, sugar, etc. into a bowl doesn’t mean you’re going to end up with a cake. You’ve got to know what proportions to use, or you’ll end up with something gross. ﻿It’s the same way with mixing. Just because the song has drums, bass, guitar, and vocals does NOT mean it’s going to automatically sound good. You’ve got to find a way to combine ALL of this information in such a way that emphasizes each part without creating overwhelm. It’s not as easy as it sounds. If you simply turn up all the tracks and click “Bounce,” you’ll likely have a mix that sounds like a train wreck. You’ve got to learn how to make each instrument sit in the mix and blend with all of the other instruments. I sang in a few choirs in college. One of the most difficult (and also most rewarding) duties of a choral director is to make this group of individual vocalists sound like one cohesive voice. Everyone can’t just belt out the notes as loudly as possible. They need to blend together. 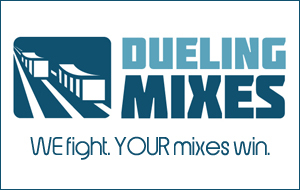 As a mix engineer, you’re “blending” together several sounds. Your job is to give each sound a “space” in the mix, place where it can be heard and yet still blend in with the rest of the tracks. I talk about this a LOT in Understanding EQ. EQ is a tool that, when used properly, can remove unnecessary frequencies from your tracks, in order to make room for the other instruments. For example, I’ll do an EQ cut in the guitars around 250-500 Hz to make room for the lead vocal, which sits in that range. You’d be amazed what a little panning can do. When you’re mixing, close your eyes and imagine you’re listening to the band playing live at a gig. Where is the drummer? Where are the guitarists? Pan the various instruments to unique places in the stereo field, and you’ll find that your mixes will open up and sound less cluttered. When in doubt, turn something down. Can’t hear the lead vocal? Try turning down the guitars and bass a little bit, RATHER than turning UP the lead vocal. The idea here is to remove unwanted elements, NOT to add new things. Have a mix that’s giving you fits? Try one of the 3 suggestions above and tell us if it helps. Sometimes the simplest changes can be the most helpful.